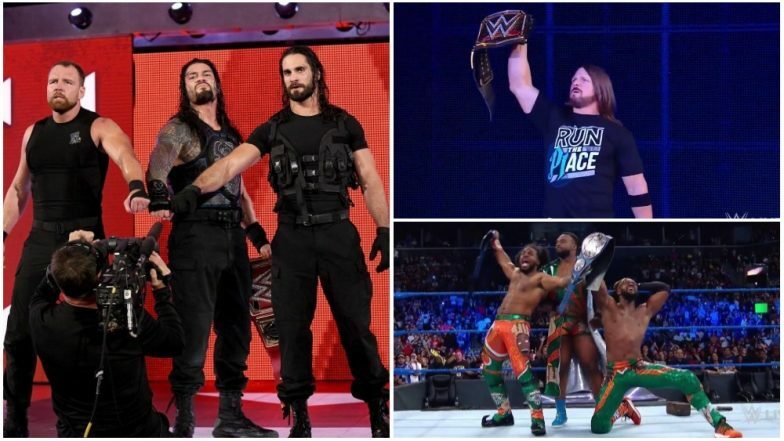 August 20: Post the SummerSlam PPV, World Wrestling Entertainment's (WWE) weekly show Monday Night RAW began with New Universal Champion Roman Reigns kick-off the weekly show. The Big Dog talked about he kept his word when he defeated Brock Lesnar last night and how he will keep his word by being a fighting champion. Roman Reigns then talked about Finn Balor, and out he came to a huge pop. Reigns vs Balor was booked for the main event. RAW Commissioner Baron Corbin had his match with Bobby Lashley, which he eventually lost. To everyone’s surprise, Paul Heyman appeared on the show and asked for Brock Lesnar’s Universal Championship rematch. Dean Ambrose had his first match after his return from the injury and defeated former Intercontinental Champion Dolph Ziggler. In the women’s division, it was Sasha Banks, Bayley, and Ember Moon pitted against The Riott Squad, where the latter won the match after much ado. Also, RAW Commissioner Stephanie McMahon addressed the women wrestlers at the ringside. However, little did she know that it would end up with her being locked in an ‘armbar’ by none other than New RAW Women’s Champion Ronda Rousey. The main event in the night saw Finn Balor locking horns with Roman Reigns with Universal Championship title on the line. The gruelling contest saw Braun Strowman walk out in middle of the match in the ending moments. Balor took advantage of the distraction; however, Reigns hit a ‘spear’ and eventually won the match. Strowman, who was standing by the ringside, decided to cash in his Money in the Bank briefcase and eventually did. Just as when he gave his suitcase to the referee, The Shield’s music hit and out came Dean Ambrose and Seth Rollins. Reigns, Rollins, and Ambrose deliver a ‘Triple Powerbomb’ on the Monster Amongst Men through the announce table. Michael Cole informs that the bell hadn’t rung. Strowman still has the MITB briefcase. The Shield does their popular fist-bump before heading backstage as Monday Night RAW went off-air. The latest episode of SmackDown LIVE began with The Miz running down his SummerSlam opponent Daniel Bryan. The A-Lister announced his retirement; however, later clarifies that it was a retirement from competing with the former SmackDown General Manager. Daniel Bryan entered the ring as the crowd went into a frenzied state. Bryan retaliates (verbally) in an equal manner. The Miz crossed the line and insulted Bryan’s wife. Out came Brie Bella to crowd’s delight. She landed a couple of punches on The Miz before Bryan ambushes him out of the ring. Daniel Bryan and Brie Bella vs The Miz and Maryse are announced for WWE PPV Hell in a Cell. Jeff Hardy finally had his revenge on Randy Orton after he hit a low-blow to The Viper in their singles match. The two brawl in the ring, outside in, in the crowd and then in the production area. It ended with Hardy hitting a Swanton Bomb on Orton as the crowd applauded in colossal praise. Becky Lynch then made her way out to the ring and justified her actions against new SmackDown LIVE Women’s Champion Charlotte Flair. Both the superstars were embroiled in a brawl even with the entire women roster coming out with SmackDown General Manager Paige to break it. Samoa Joe and AJ Styles had an altercation again, with the former making personal attacks on the WWE Champion. Meanwhile, Paige granted Carmella her rematch, which will be held next week, after the former champion approached her backstage. The main event of the show saw The New Day and The Bludgeon Brothers compete in a no-disqualification Tag-team championship match. The gruelling bout saw both the teams fighting tooth-and-nail to win the title on the line. However, it was Kofi Kingston and Xavier Woods who pinned Harper for the win. SmackDown LIVE went off-air as The New Day began the celebration of their new title reign.